Great Room Ceilings | What's the best ceiling height? 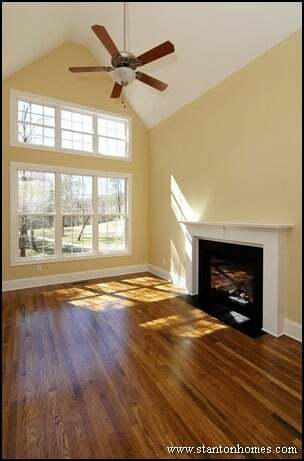 What's the ideal height for you great room or living room ceiling? 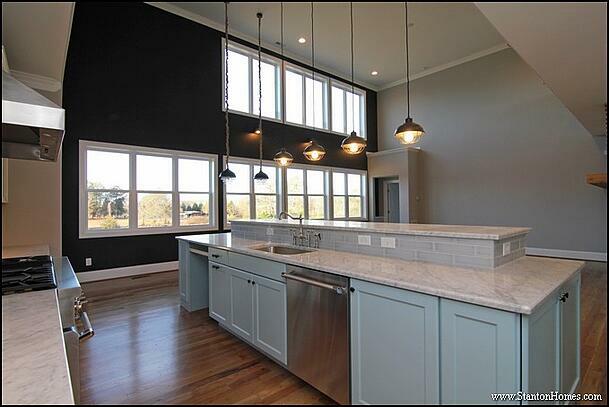 How tall are most ceilings in a new home? How tall are two story ceilings? 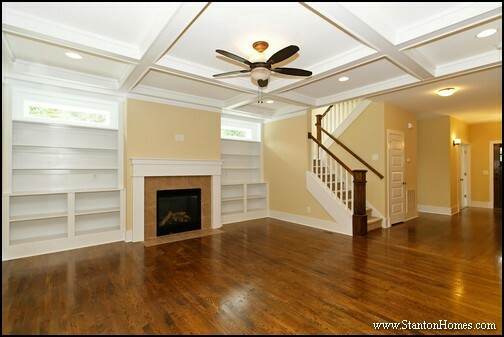 Are vaulted living rooms considered "two story"? Get answers to these home design questions, with 13 examples of great room ceiling heights - with photos of 8', 9', 10', 14', and even 20' to 24'. Take a look at some common ceiling heights, with tips on when to vary how tall rooms should be. 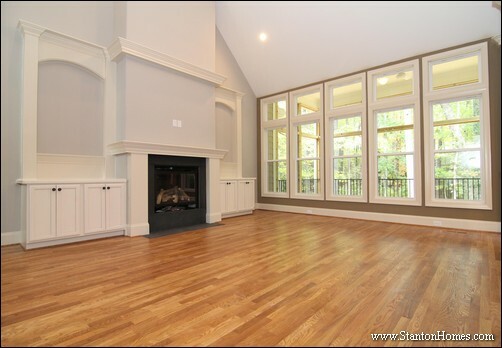 This 14' ceiling leaves room for massive Half Round windows above the French doors, and gives the fireplace wainscoting enough distance to pull the eye upwards in classic Southern style. Here is an example of a 2.5 story "Ship's Prow" wall of windows. The ceiling is 20 feet tall inside a custom mountain house floor plan. 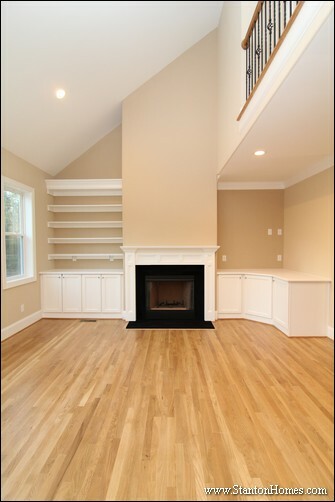 Staggering between ceiling heights can give open concept floor plans more visual separation between rooms. This great room ceiling is 11 feet tall. The kitchen/breakfast ceiling is 9 feet tall. The step up into the great room leaves room for a coffer ceiling (a cross beam design). 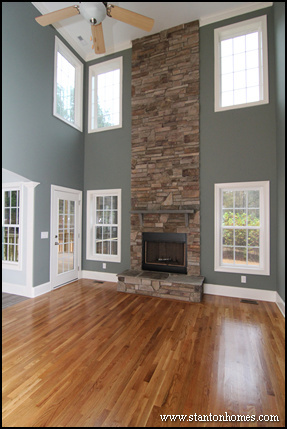 A craftsman style great room - with built in bookcases on each side of the fireplace - is 9 feet tall. 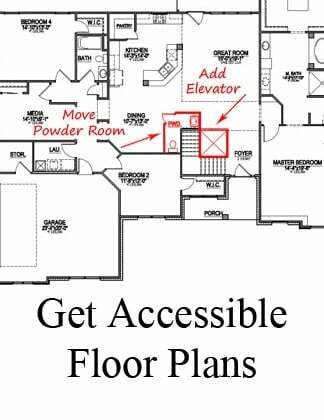 Are vaulted living rooms are considered "two story" rooms? 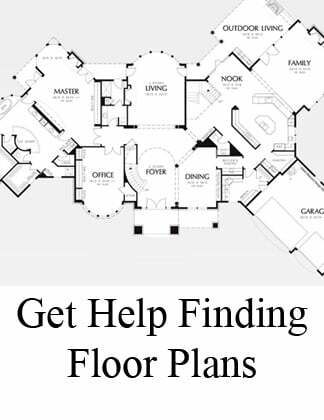 Yes, according to many architects, floor plans with vaulted ceilings are considered two story rooms. 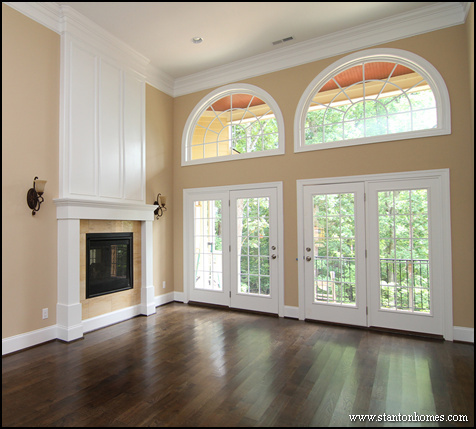 This living room is an example of two ceiling styles. A vault stretches from the backyard-facing window wall. A "standard" ceiling height runs underneath the upstairs hallway/balcony. The double vaultleaves room for a second row of windows in this keeping room. 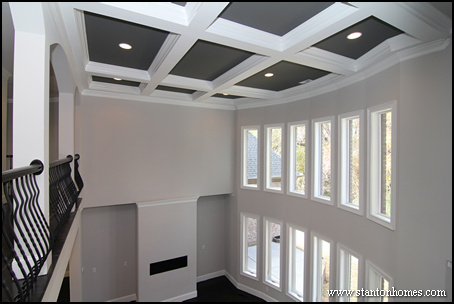 This vault has an extended height ceiling, designed to fit picture windows. 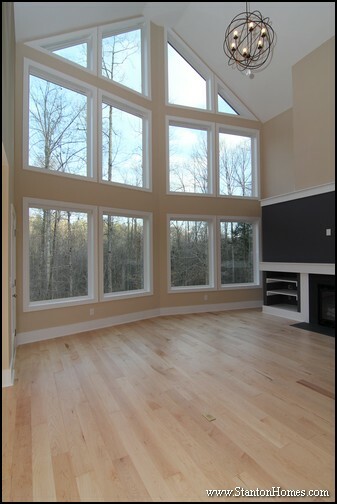 This great room is a full 18' two story height, making space for a full wall of windows inside this mountain home style floor plan. Read some myths about two story ceilings, here. 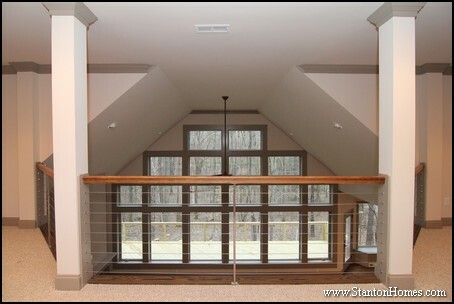 Here is an example of a contemporary two story, urban loft style great room. A curved wall can make a two story ceiling feel even higher. 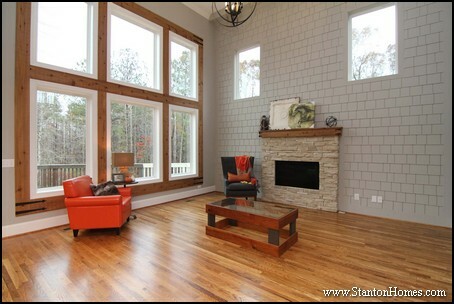 See our entire great room photo gallery, here. 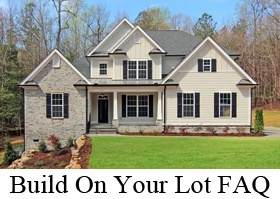 New homes are under construction in the Horizon neighborhood of Pittsboro, a popular area for homes on acreage within Chatham County, NC. 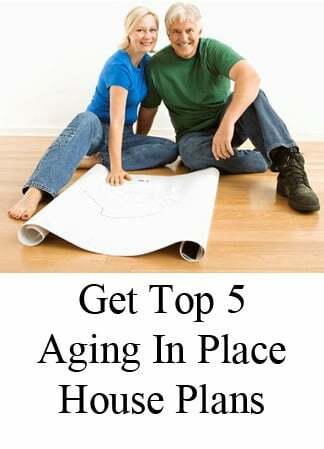 Want to know more about the home building process? 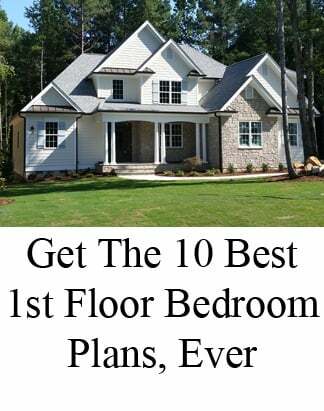 See photos of homes under construction, with details on all the steps it takes to paint the interior - with major milestones to build, below. 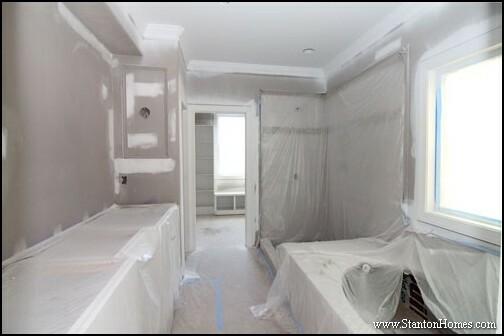 Ever walked through a home under construction and wondered what it takes to get all those colors on the walls? 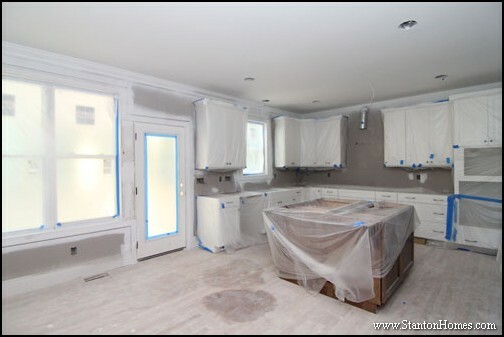 What's the process for painting a new home? Finish rest of house - no more paint yet! 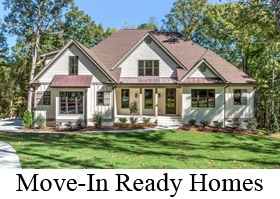 The exterior is stone and cement fiberboard with white porch columns, flagstone porch, and metal roofing accents. 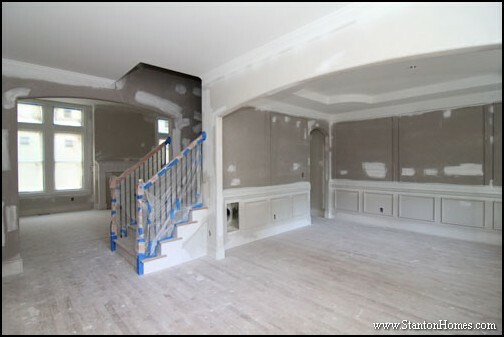 Inside the foyer, archways open to the formal dining and living room. The staircase divides these two high-traffic areas. 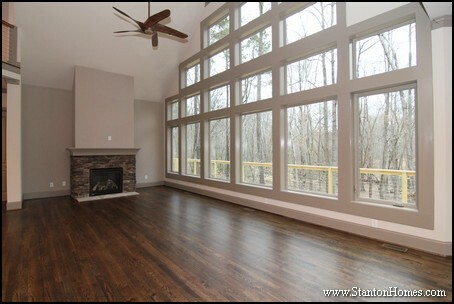 A wall of windows opens up the great room - with island kitchen beyond. The kitchens shares a breakfast area, with glass french door leading to indoor-outdoor living spaces. 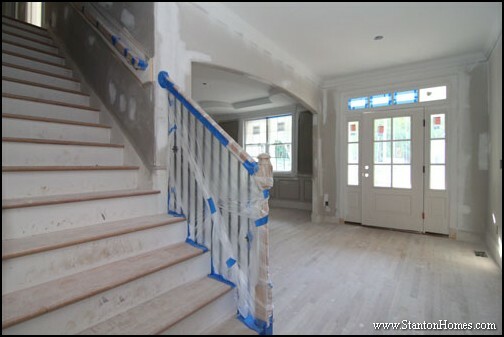 Another Custom Home step, see those "stains" on the floor? 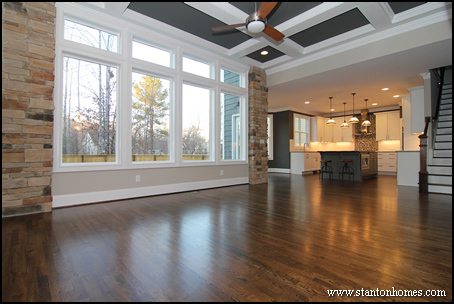 Those are stain samples, so that the homeowner or designer can select the very best color for the site finished hardwoods to match the interior paint, cabinetry, and countertops. 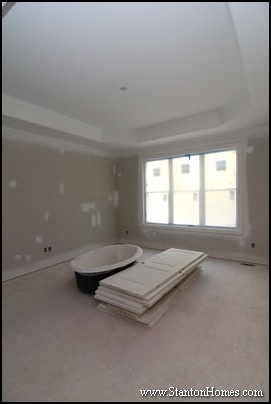 The his and hers master bathroom leads into the walk in closet with tons of built in shelving. Master suite trey ceiling and window wall open up the first floor bedroom space. 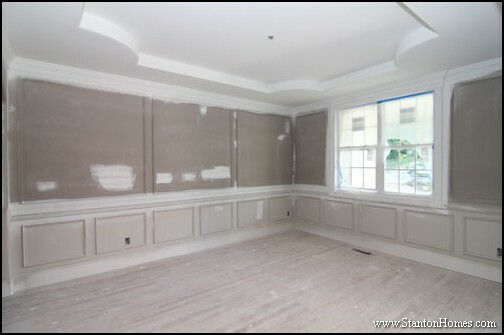 Inside the formal dining room, wainscoting trim and two-tone walls are beautiful touches - and check out the trey ceiling curves! Tall ceilings, well-placed windows, and archway openings keep light, bright spaces flowing throughout this Chatham County custom home. 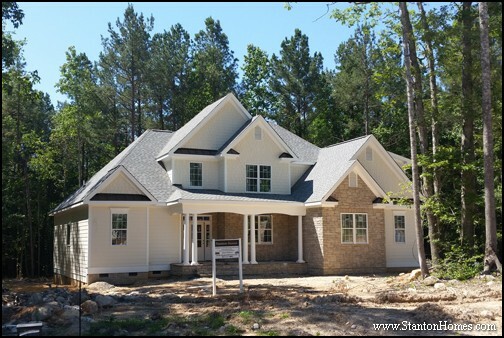 Two Stanton Homes, The Blueridge and The Cassiopeia, are now under construction. 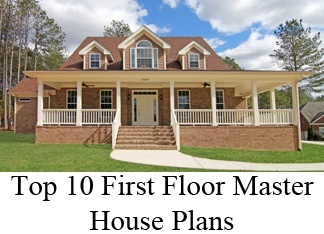 The Cassiopeia is a main floor master home for sale with 3,144 sq ft, 4 Bedrooms, 3 Bathrooms. New home address: 65 Brookhaven Way, Pittsboro, NC.